A residential on-street permit entitles permit holding residents to park their automobile on the street within a specified area exclusively during permit parking hours. This program generally services those residential areas where driveways and/or garages are not common. Residents can renew on-street parking permits online or in-person at the Permit Parking office. If you are changing your place of residence, selling your car or for any other reason no longer require a permit, permits may be returned by mail or in-person at the Permit Parking office for a refund. The refund amount will be pro-rated based on the unused full months remaining in the permit parking term. Note: All refunds are mailed in the form of a cheque. Please allow 2-3 weeks for the refund cheque to arrive. Permits may be re-issued for a change of address, to transfer the parking permit to another car, or if lost. Bring in proof of your change of address (lease, bill, or other documentation with your new address) along with your current permit to get a new permit for parking at the new address. If your new place of residence is not within a permit parking street or area, or if it is and permit parking spaces are not available, you may be eligible for a refund. (See Refunds for Returned Parking Permits above). Permits are issued to a specific licence plate and are not transferable from vehicle to vehicle. If your licence plate number has changed, return your permit along with a copy of your new vehicle registration, and a permit will be reissued. If your automobile is being repaired or temporarily replaced, and you wish to park your replacement vehicle on the street, you can go to the Permit Parking office and obtain a no-charge temporary parking permit. You will be required to present the permit holder’s driver’s licence, proof of replacement vehicle can be any of the following: police report indicating accident or theft, collision/accident report indicating your vehicle was in an accident, fax/letter from insurance company/manufacturer or dealership stating your vehicle is being repaired/there is a recall, body/repair shop or dealership letter/invoice indicating anticipated repair completion date. Bring in the permit holder’s driver’s licence (or a photocopy) that reflects the address where the permit is for, and a permit will be reissued. If you applied by mail or renewed online and did not receive your permit via the mail, you are entitled to a reissue free of charge. Permits are issued to residents only on a six months basis, although permits for two consecutive terms are available. Terms are from December 1 to May 31 and from June 1 to November 30. All permits issued during a term will be effective until the end of that term. To determine whether your street or area is designated for permit parking and spaces are available, contact the Permit Parking office. Ensure that your street or area is designated for permit parking and spaces are available. To obtain more information, contact the Permit Parking office. Complete a permit parking application form. Assemble photocopies of proper documentation. Proper documentation includes a valid vehicle registration and valid driver’s licence reflecting your name and your address for where you want the permit. Determine appropriate and acceptable method of payment. For more information, see Fees above. Submit application, documentation and payment, in-person or by mail to our office. Bring a letter from the insurance company indicating that you are insured under the policy for that vehicle or bring the actual insurance policy (not the wallet size pink slip) that lists you as the principal, secondary or occasional driver of the vehicle. Proof of insurance does not change the permit fee charged for multiple vehicles under the same name and at the same address. Second and subsequent vehicle permit rates will apply. Permit Parking will issue a permit if the vehicle registration has the same last name, but a different address, to accommodate a parent-child relationship (i.e. student living away from home attending an educational institution). Permit Parking will issue a permit for a company vehicle provided the vehicle registration reflects a company name (e.g. Smith Consulting) and not an individual’s name (e.g. John Smith). Ensure vehicle registration reflects “personal use only (PUO)” and the vehicle is not more than 5.2 metres in length or has a registered gross weight (RGW) of more than 3,000 kilograms. Bank, credit card or utility bill with your name and address for where you want the permit. In order to renew your parking permit for the next permit term, your driver’s licence and vehicle registration must be updated to match the address on your residential permit. If there is currently parking on the property where you reside, you must provide evidence that you do not have access to it in order for you to obtain a permit at a lower fee. For applicants who own the property: a photocopy of the ownership(s) of vehicle(s) registered to the property owner at that address and parked on the property. For applicants who are tenants: a recently dated and signed letter from the property owner stating that access to on-property parking is not available. If you live in an apartment, condominium, or townhouse, the letter should be on letterhead from property management. Certain streets and areas are wait listed if there are no available parking spaces. To go on a wait list, complete a wait list application form– FIX and submit to the Permit Parking office. Once the application is processed, you will be notified when a parking space becomes available. All fees are subject to an annual inflationary increase based on the City’s User Fee Policy and change without prior notice. 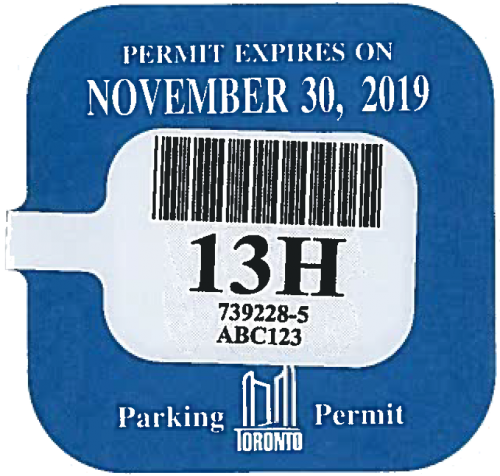 Residents applying for a parking permit after a permit term has already started will be charged the monthly fee from the date of purchase (permits cannot be purchased with future effective dates) to the end of the permit term. For example, a permit issued mid-month is still charged that month’s fee. For further clarification on permit fees, contact the Permit Parking office. Permit parking is implemented on either a street-name basis where parking is restricted to one specific street, or on an area-basis where a number of streets have been grouped into permit areas in order to maximize the available parking. In area-based permit parking, residents may park on any licenced street within their permit area, but are not guaranteed a parking space on their specific street. Area-based permit parking provides greater flexibility by enabling permit holders to park not only on their licenced street but on other licenced streets within their area should space not be available on the street where they live. Within each permit area there may be significant differences in the operating hours of the permit parking program. For example, in the Toronto community, there are currently over 70 unique combinations of permit parking operating hours which were developed over time, in consultation with area Councillors and community representatives, in response to specific concerns e.g. long-term non-resident parking. These operating hours are clearly posted at regular intervals on each street licenced for permit parking within the area. If you would like a boundary map of your permit parking area, email or visit the Permit Parking office. A permit holder who parks on a street authorized for permit parking must park in a legal space during licenced parking hours shown on the signs on the street. Though subject to other existing traffic regulations, permit holders generally have the privilege of parking their vehicles overnight and are exempt from the 1, 2, and 3 hour parking restrictions. Conversely, vehicles without parking permits may be tagged if parked in parking spaces designated for those with permits. The permit parking by-law is enforced by Toronto Police Services, Parking Enforcement Unit. Contravention of the by-law may result in the loss of your permit parking privilege. Where Permit Parking signs and Pay & Display signs co-exist, a valid permit holder will not be required to pay the meter or parking machine. A vehicle with a valid permit which remains parked in the same location on a street for more than seven consecutive days may be tagged and towed at the owners’ expense. Where there is a change in parking from one side of the street to the other side, a permit holder shall be given a grace period to move their vehicle from 9:00 p.m. the previous night to 9:00 a.m. the next morning on changeover days. For a permit to remain in effect, the permit must be visible and affixed to the lower windshield on the driver’s side, the vehicle registration must remain valid, and the validation sticker must be affixed to your licence plate.